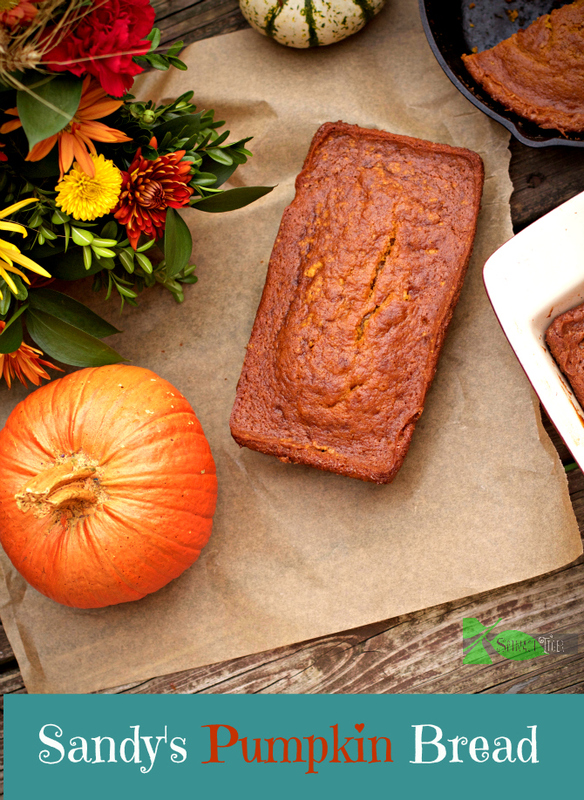 If you love moist, flavorful, pumpkin bread that takes you back to childhood, look no further, but this post is about much more than that. It’s about the way a food memory is imprinted into our hearts and connects us to those we love. Please read this post today. It’s a special one. I received a message from a friend, JR, today. His wife, Mandy, also a friend, recently lost her mother, and this is the first holiday season without her. I hope this touches you as it has touched me. The holidays can be an amazing time filled with love and family, but it can also be a painful reminder of those we’ve lost. Our home will be a host to both sides this year as we gather for the first time without my mother-in-law, Sandy. Sandy passed unexpectedly in March after a long battle with multiple health issues we all thought she’d overcome. 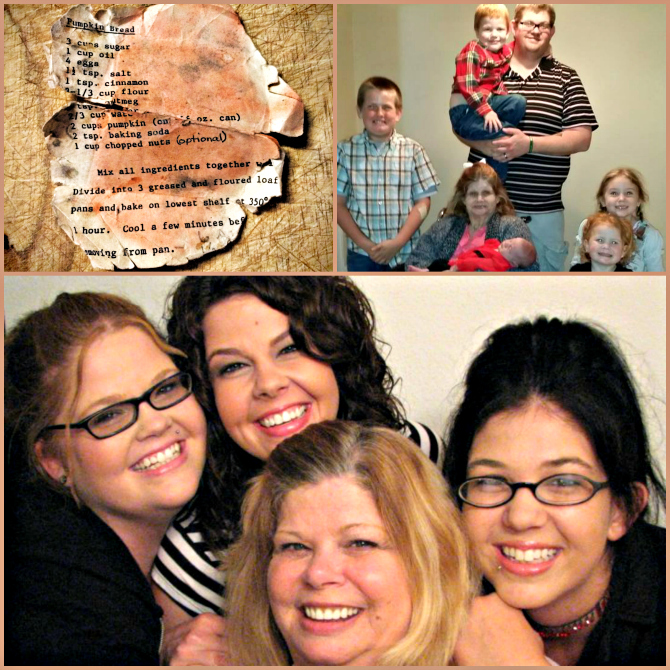 She left behind three beautiful daughters, a strong son and a handful of the cutest grandkids anyone could ask for. I can’t speak for the rest of the family, but my wife, Mandy, is already finding herself weighed down with thoughts of Thanksgiving and Christmas without her mama. I know there’s nothing I can do to ease that pain, but I feel God put an idea on my heart to help honor Sandy’s memory during this time. Sandy loved Thanksgiving. She was an amazing cook and enjoyed any excuse to bring her family together around a big meal. It was even better if she could get her girls in the kitchen cooking alongside her – a feat which was not very hard to accomplish since they all love cooking as well. For as long as I can remember, Sandy’s famous Pumpkin Bread has been the “must have” treat for the holidays. It’s funny how a recipe can hold so much sentiment and yet not surprising given how easily the familiar smells and tastes can recall memories of home. 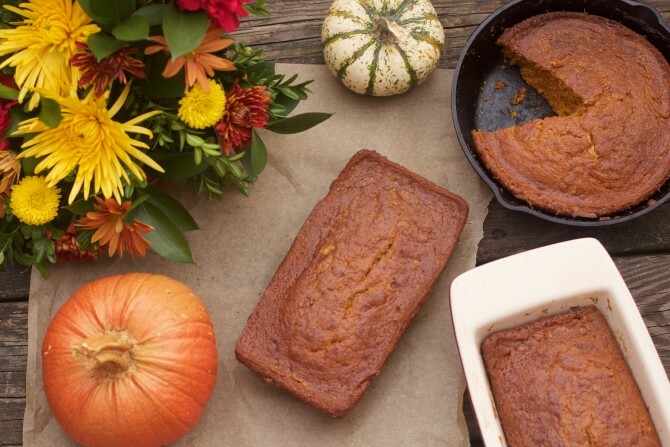 It is my wish that Sandy’s Pumpkin Bread will bless your home and add to your traditions while honoring and remembering an amazing mama whose love can be found in every bite. Well, my lovely readers, perhaps you are missing your loved one this holiday. I am fortunate enough to have Retro Rose (my mom) living right up the street. She helped me make many of the Thanksgiving recipes you enjoy here, and we even scoped a few live ones last weekend, as I shared her with the world. And, how about that JR? What a good husband! It’s amazing how people can live on in the food they served us. 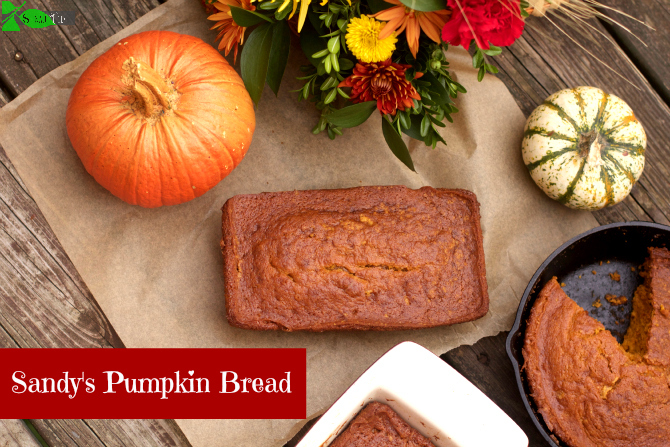 Enjoy Sandy’s Pumpkin Bread, and celebrate the life she lived, sharing food with love. Whether mama is here with you or not, if you make one of her dishes, post a picture, and hashtag #remembermomsrecipes. A family recipe remembering Sandy and her famous pumpkin bread. Divide into three loaf pans. Spray loaf pans and/or cast iron frying pan with baking spray. Bake for 60 minutes at 350 degrees F. in lowest rack of the oven. In my convection oven it was done at 50 mins. Cool 10 minutes before removing. There’s something about food which really does capture the essence of memories and those whom we hold dear. What a touching story — thank you for sharing. My mamma has been gone three years October. We were so very close and she lied to cook. I know exactly what I’ll be making with that hashtag! It’ll be for Christmas — that was a very special holiday for my parents. What a wonderful remembrance, and an absolutely delicious looking recipe. I’ll definitely make Sandy’s pumpkin bread for my family this year.